It's not just the castle that no longer exists, but also the style of shops highlighted in the museum, selling the sorts of goods you often only see in antique stores. Among other shops, they have an old pharmacy, leather-worker, clock repairer, bistro, umbrella maker, spice market, and millinery (hat-maker). The contents of each boutique was purchased at the closing of a genuine business and eventually reconstructed here in the museum. But Ye Olde Shoppes are not relegated only to history. 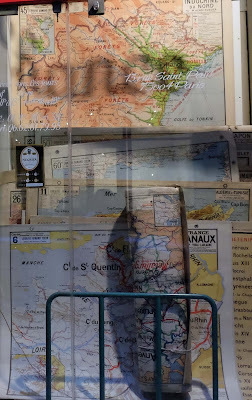 In Paris, I find this collection of four shops just within one tiny block of the Marais, in the 4th arrondissement, selling turn-of-the-century style lace, baptismal gowns, old-fashioned hanging maps, antique objets d'art, fabric swatches, and brick-a-brack. With a hand-made lace shop selling baptismal gowns in the Belle Epoque turn-of-the-century 1900's style, frankly, they don't look much more modern than the shops in the Musée aux Anciens Commerces -- other than the sign in the window that says you can pay with plastic (CB=Carte Bancaire=Bank Card). Délice du Bocain is a raw goats' milk cheese made -- and mostly sold and eaten -- in the Vendée. It's manufactured only by one cheesemaker, Aumand, which has been in business since the 1970s. Aumand produces about 2000 cheeses per week, around 100,000 per year, but not all of them are Délice du Bocain. They are salted individually and carefully aged between 7-21 days before distribution. Among these cheeses, the "Bocain" line is their most traditional-style cheeses, made and sold regionally. 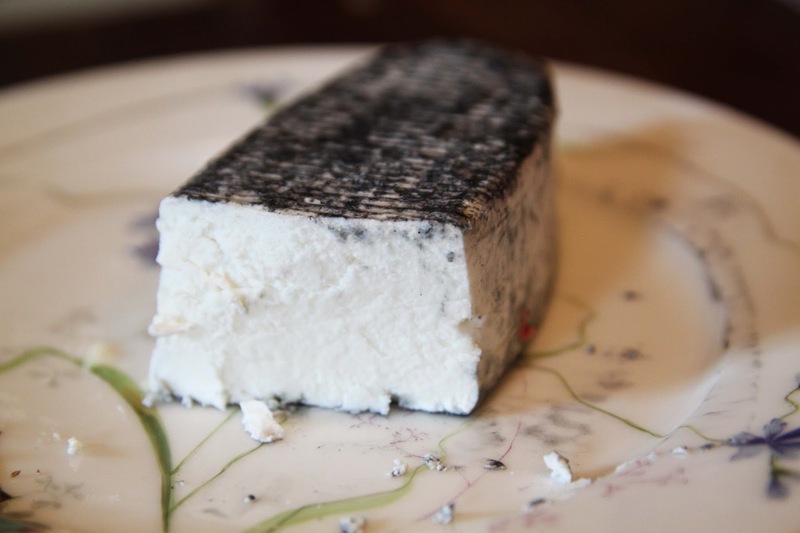 The snow white interior is offset by some very black ash dusted on top, and it's a lovely cheese both to look at and to eat. The flavors of the bocage (the fields and farms) really shine through, with stronger elements of grass and goat than of cream or butter. It's a salty, fresh, tangy cheese that just begs to be spread on delicious bread and, if you're feeling decadent, drizzled with some elegant honey. This cheese is a delight of the "Bocain" or the people who live in the countryside, the bocage. This is a place where fields abut, but houses, inhabitants, and stores are few and far between. So why Délice du Bocain for a story about old time shops? First of all, we visit the Musée aux Anciens Commerces while we are on a trip to the area that included Nantes, Angers, and the Vendée. Also, just look at the sticker on the cheese: There's a very old-timey guy lounging around on it, with the kind of old-timey hat and high-collared shirt that can probably only be found in an antique or old-time themed shop at this point.